My bathing beauty photoshoot. I know I wore this bathing suit last summer (so sue me I only have one bathing suit), but I only posted one picture and it was pretty crappy. Oh how things have changed in a year. Definitely not the least bit afraid to be posting bathing suit pics now. By next year I hope to have acquired a bikini. Yay for body positivity! These were taken at the cottage which is on Georgian Bay. It was one of the hottest days while we were there, perfect for swimming and lounging around. I still adore this bathing suit, it was the first thing I ever ordered from ModCloth. The shipping and duty fee nearly killed me (especially since I had no idea there was duty on top), but it was totally worth it. I only got to wear it once last summer, but I have used it a lot more frequently this year. Hopefully I can get a few more swims in at my aunt's pool before the summer is done. And that concludes my unintentionally nautical themed set of cottage posts. I hope you are all having a good week, can you believe it is the end of August already?! I certainly can't. Here's to one last summery weekend. Happy Friday lovelies! That bathing suit is amazing! And looks great on you!! Thank Lucy! I fell for it as soon as I saw it on ModCloth last summer :) I wanted to buy that whole collection actually, haha! I LOVE YOUR SWIMSUIT. You look great! Haha! YES! Best bathing suit advice I've ever seen! Love yours too! Super cute! OMG you look super cute and sassy! Your my September blogger spotlight! Check it out today, hope you like it. Also, I need your badge for my blog, since I am no longer using Passion Fruit, do you have a code for your badge to email me? That suit is absolutely adorable, and you are totally rocking it! 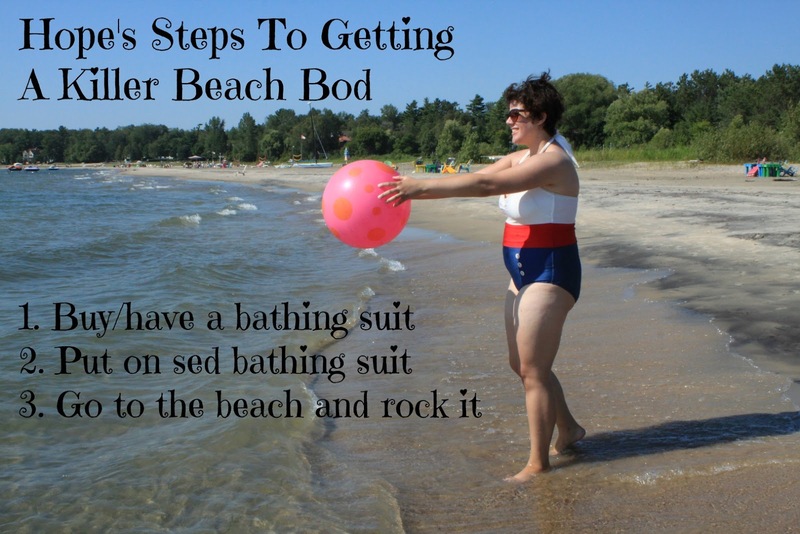 And I am loving your steps to getting a killer beach bod, because they are totally true! Thanks Kym! And thanks again, I am super flattered, great post. After much debate I decided to give them a try for one year and see how it goes. I have no idea how to make the coding for a button (part of the reason why I kept passionfruit haha) but I will look into making one for you. I know how to place the coding on my own blog though if you want to send me your button. Super long comment reply right here. Thanks! I just hopped over to your blog and I really like that mason jar light fixture you made, super cool!